Tom, Ju-Hee and Hanna's Trips in this world: snow its only the 7th Sept!!! snow its only the 7th Sept!!! 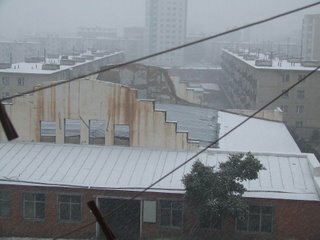 woke up to what I thought was fog which is unusual in Mongolia but in fact turned out to be SNOW!!!!! 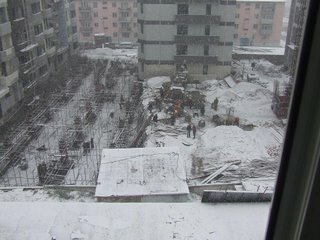 which does not seem to stop people building here. so guess I will still have to go to work ;) but maybe later. had a few days of productive work. becoming more of a miracle worker than I imagined curing at least 2 computers of what I though was motherboard failure but seems to have just been the ram and the power supplies. so all going well and got plenty to do.